The Quantum Qv2 is designed to enhance the musical performance and picture quality of any audio or video system, delivering readily demonstrable benefits at an incredibly affordable price. It can be used as a â€œstand aloneâ€� product or to complement a full QRT system with a QBASE and Qx2 or Qx4. The Qv2 works directly on the AC line, introducing a carefully calculated range of pulsed frequencies, clocked from the original 60Hz waveform. The result is a drop in noise floor, with a commensurate increase in image depth, dimensionality and presence, significantly increasing the realism of both musical and visual performance. 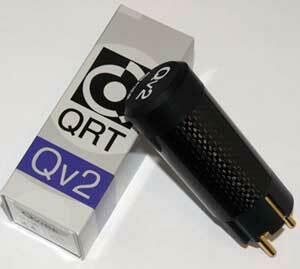 Like other QRT products, the benefits are cumulative and Qv2s are even more impressive when used in multiples. The compact, â€œplug-topâ€� construction of the Qv2â€™s mechanically tuned high-tech housing allows it to be inserted into any free socket on your systemâ€™s AC line â€“ although adding directly to a QBASE maximizes the benefits. The Qv2 employs a mechanically tuned carbon fiber housing and high quality gold plated connection pins. It is built entirely in the USA and carries a two-year warranty.